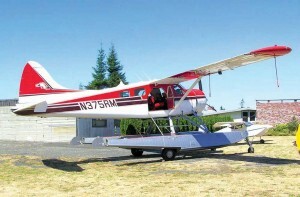 This colorful De Havilland Beaver was built in 1957 (Diamond Point). Mother Nature cooperated with warmth and clear skies for two recent aviation events in northwest Washington. 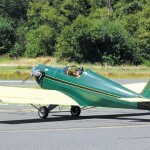 The Experimental Aircraft Association’s Eastsound 937 Chapter held a successful fly-in August 5-7 at Eastsound Airport on Orcas Island. A variety of kit-built and factory-built aircraft brought pilots and their families (and pets) from Washington, Idaho, Oregon and Canada, and as far away as Delaware to this beautiful spot where northern Puget Sound meets British Columbia’s Georgia Strait. On Saturday, Aug. 6, just 37 nautical miles across the water due south of Eastsound, the Diamond Point Airport Association hosted Airport Appreciation Day for local residents and visitors who came by air from near and far, one even from Louisiana. 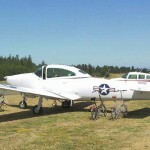 This well-maintained private airfield sits at the tip of a peninsula that thrusts into the Juan de Fuca Strait between Port Townsend and Sequim, just 25 nm SE of Victoria, B.C. The association’s Tom Richardson chaired this event. 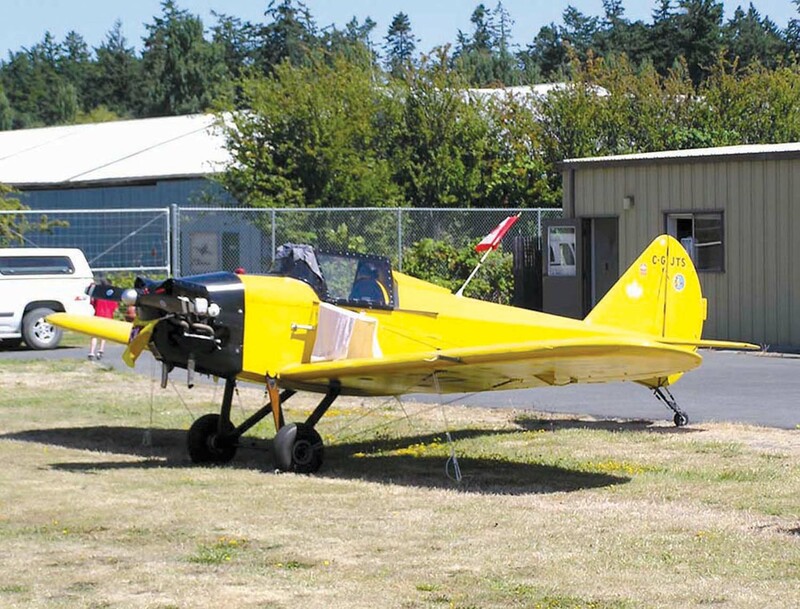 Concurrently with this celebration, the EAA’s Sequim 430 Chapter sponsored a “Young Eagles” activity in which local pilots took children on first-time flights to introduce them to the exciting world of aviation. Both events offered visitors rides in interesting aircraft. Brilliant sunshine, clear skies and smooth air made for pleasurable experiences and exhilarating open-cockpit rides. Passengers and pilots in the Curtiss Wright Travel Air 4000 evoked images of WWI pilots, Wiley Post, Amelia Earhart and Howard Hughes in their close-fitting leather headgear. At both events local citizens joined visitors in admiring the consummate craftsmanship evident on either homebuilt aircraft or painstakingly restored vintage planes, feasted on grilled burgers and hotdogs and refreshing cold drinks, and watched fly-pasts of antique and 21st century aircraft designs. At Eastsound, a roaring fly-by of a North American P-51D Mustang and a Douglas AD Skyraider from the Bellingham Heritage Museum stirred the crowd. Interestingly, aircraft kept coming and going all day, fly-in visitors mixing with scheduled flights of Kenmore Air and San Juan Airlines. An exact count for the three-day event is uncertain, but EAA volunteer Jim Newland, who coordinated the ushering of planes to their parking spots, counted over 160 aircraft on the field at one time. Aircraft types included the one-seater Fly Baby, open-cockpit biplanes, Van’s RV-4s 6s and 9s, North American SNJs, a Max Holste Broussard, Lake amphibians, Glastars, a Navion B, V-tail Bonanzas, Mooneys, C-172s, Piper Cherokees and some rather unusual homebuilts. Even a classic Cessna 195 and Citation jet dropped in. Key to the success of Eastsound’s undertaking were fly-in chairman Barbara LaBrash, pilots Dwight Guss, Beverly Ranklet and Rod Magner, Myrna Fant who supervised the food shack, and Bill Clark who registered visitors. EAA Chapter 937 volunteers did an excellent job of guiding aircraft to short-term or overnight parking spots. Evening activities included a banquet-style dinner and forums by guest speakers. A number of attendees camped right on the airport next to their planes. 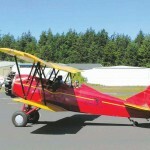 At Diamond Point, participants enjoyed the nostalgia of a rare 1930 Stinson SM-8A Detroiter, a 1928 Curtiss Wright Travel Air 4000 and colorful Mooney Mite, among other antique aircraft, thanks to the Port Townsend Aero Museum, whose members’ dedication and perseverance restored these antique aircraft to flying condition. More modern aircraft made high-speed passes to excite onlookers. EAA member Jim Cone coordinated free flights for some 32 enthusiastic local youngsters who ranged in age from seven to 17. Pilot/owners like Peter Bahnsen volunteered their time and their planes-—two Pipers and a Cessna—that carried the Young Eagles aloft. Diamond Point is also home to possibly the largest flock of Globe Swift aircraft in the nation. Nine of these aircraft are based here. Resplendent in a variety of colors and markings, these aircraft belie their age, looking like new, thanks to excellent maintenance and loving care lavished on them by owners who appreciate and respect the proven design. Also on display were two gorgeous de Havilland DHC-2 Beavers—-one on wheels, the other on amphibious floats—a glossy Lancair 360, a motor glider that looks like a precursor to the Diamond aircraft family, along with Grumman Cheetahs, Rockwell Commanders and a colorful Yakovlev Yak-11. Tom Staples flew his Bowers Fly Baby in from Canada (Eastsound). On the first day of the Eastsound fly-in, widespread fog and marine cloud over most of Puget Sound early in the day kept many pilots on the ground, so attendance didn’t swell until late Friday. Event planners were initially concerned that they might experience a repeat of the previous years’ rain-out of the fly-in. Happily for all, skies cleared. Saturday saw an even greater influx of visitors. The sunshine was hot and many people and pets sought shady relief under airplane wings. Both events were organized superbly. Probably because of that, one could sense an air of intimacy and ease among participants. At both events, pilots and kit-aircraft builders compared notes with one another and readily shared tales of the joys and frustrations of their passions, passing on nuggets of useful info to would-be builders and interested pilots of “regular” planes. All in all, two excellent events bearing witness to perhaps the finest elements of aviation dreams, camaraderie and the popularity of things flyable. 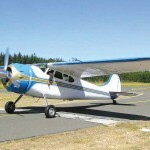 This classic Cessna 195 is from Delaware (Eastsound). 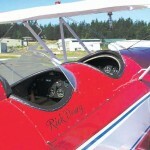 An open cockpit thrills riders in this Curtiss Wright Travel Air 4000 (Eastsound). 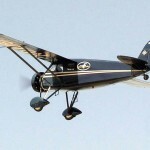 Open cockpits of this Great Lakes biplane evoke a sense of aviation history (Eastsound). Harvey Brown’s white Navion stood out clearly (Eastsound). 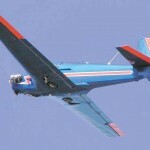 A locally-based single-seat Mooney M-18C “Mite” takes to the air (Diamond Point). 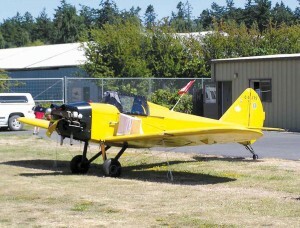 A Ryan ST3KR waits to take off (Eastsound). Nostalgia flows from the slipstream of this rare Stinson SM-8A Detroiter (Diamond Point). 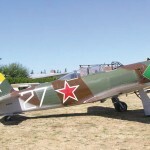 This Yakovlev Yak-11 shows the loving care of proud ownership (Diamond Point).